BBC One’s spy drama Spooks was more than just the UK equivalent of 24. Running for ten seasons, with actors like David Oyelowo, Richard Armitage, Jenny Agutter, Sophia Myles and Matthew Macfadyen all coming and going at various points, it popularised the spy serial once again amidst a post-millennial backdrop, and still holds dear to fans’ hearts even to this day. Naturally, it’s prime material for a cinematic spin-off that has the potential to widen its appeal to those who may have never seen an episode of the show before – something which this reviewer can admit to being without the fear of being hunted down like Rolf Harris in Toys R Us – and so, the resulting feature entitled Spooks: The Greater Good should pull that off rather nicely. It’s a decent, if understated, spy thriller more in the vein of Bourne than Bond, packed with plenty of twists and turns that ultimately come down to a very basic story of trust and deceit, and while nothing truly screams originality in terms of plot it’s competently executed with a satisfying amount of suspense and intrigue. Director Bharat Nalluri, a Spooks veteran himself, returns to the series after directing both the first and final episodes of its TV run and lends his experience with feature directing – including, but not limited to, direct-to-video sequel The Crow: Salvation and screwball comedy Miss Pettigrew Lives for a Day – to make a worthy adaptation that hits all the basic notes whilst never neglecting its television origins. In some respects, that can be a problem since there are multiple scenes that are paced exactly like an extended episode, surely neither Nalluri’s or the BBC’s intention, but at least it guarantees that fans of the series will feel right at home. The cast is led by Peter Firth as the series’ sole surviving character Harry Pearce, who here promptly vanishes after fumbling a terrorist handover that sees said terrorist, Elyes Gabel’s Adem Qasim, escape with extraordinary ease. Firth easily excels here, returning to his most iconic role as if he never left and presenting to new viewers a highly watchable and engaging character to get behind, at the very least giving them a reason to watch the preceding series. Fellow veteran actors also pop up including Jennifer Ehle, David Harewood, Tim McInnerny (reprising his own role from the TV series) who all do fine with what roles they are given, although they inevitably play second fiddle to Kit Harrington’s Will Holloway – a new character created especially for the film – who isn’t as compelling or even that interesting as Pearce is. Some of the newer audience members unfamiliar with the show’s format may also be struck by how relatively low-key the action is. For instance, there are not as many action set-pieces with the only main international locations visited being Moscow and Belin, and even then it’s not for very long – hell, even the climactic showdown is entirely set in an indoors capacity. At least, this is what most people going in expecting something more like a Bond film than, say, Tinker Tailor Soldier Spy will feel; Spooks was never meant to be a 007 clone nor was it meant to even wholly resemble something that Robert Ludlum would conjure up in his sleep. It is what it is, and it so happens to be a steadily-paced espionage thriller with gripping characters that every once in a while have something happen to them whilst on duty. As a kind of gateway drug to binge-watching the entire series (it’s got to be available in some capacity, right? ), it works; as long as the rest of the series is as interesting, if imperfect, to watch as the film is then sign us right up. We can imagine that already existing fans will get heaps of satisfaction from watching it, pitting some of their (surviving) main characters in new and tense situations while telling its own story worthy of a theatrical release at the same time. It’s not a game-changer when it comes to TV-to-film adaptations, and we can honestly think of ones that perhaps did a far more affective job than this one (though it certainly beats Mrs Brown’s Boys D’Movie by many a mile, at the very least), but Spooks: The Greater Good is perfectly fine for audiences both old and new. 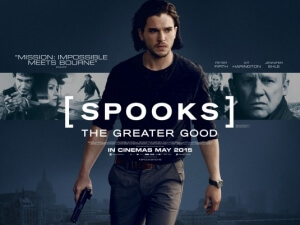 Spooks: The Greater Good is a decent adaptation of the popular TV series, providing a satisfying amount of thrills and familiarity with its already-existing fans while also luring in new audiences with its tight tension and engaging, if understated, action.